Liver – step aside, gut health – take a seat, heart care – we’ve got you, emotional wellbeing – it’s a big TICK. Your hormones are about to get happier. It’s Spring and it’s time to feel great. Cleanse Yourself – the 5 day Cleanse Course is here for you! No matter how healthy you are, there’s never been a better time to cleanse – it’s SPRING and it’s wonderful. But even if you are on the other side of the planet (I feel for you… I just adore summer and saying goodbye is H A R D), it’s the perfect time to cleanse. Either your gearing up for summer or you body needs some TLC post summer. I’ve come to learn through clinical experience the body functions so much better when it runs tidy and unpolluted. This means flushing out the liver, keeping our gut happy and ensuring our digestive system is in fine working order; it makes way for a clean system that can function at it’s best; helping balance hormones and on the whole, we are nicer people for it. But also, there are so many illnesses running rampage in this big wide world of ours. We need to be reminded that our bodies aren’t punching bags and they are forever in need of some tender loving care. The first step in creating way for a healthier body for me, is to cleanse. Whilst it isn’t the magic button for treating disease, it begins the process of setting up the foundation toward wellness, clearing out the backlog and giving the body a little break. We don’t necessarily associate the build up of toxins and a sluggish digestive system as stress, but this is absolutely how your body sees it. When we address excess stress and unnecessary load, we create space within ourselves to thrive. Traditional Chinese Medicine (TCM) doesn’t specifically draw on the idea of detoxification as we know it in the west, however it more so recgonises when specific symptoms indicate that the organs aren’t working at their best and inadvertently helps to move out toxins (often referred to as heat, cold or damp). For example, excess heat in the body can lead to issues including skin rashes, thirst, loose bowels and headaches – not too dissimilar to the symptoms we would associate with a build up of toxins. What’s more, whilst TCM isn’t specifically calling on treatments to ‘detox’ many of the herbal ingredients we use have amazing cleansing properties. Cleanses and detoxes have at times gotten a bad wrap, mostly because they are so wide and varied. We’ve been told it’s not necessary to cleanse and in a perfect world, I’d have to agree. But our world is far from perfect and we can’t live our lives in bubble wrap so it’s important that we look at ways to eliminate the toxins that build up from daily exposure – from chemicals in our environment to those that make their way into our foods and body products. Cleansing may have also fallen in the spot light for the wrong reasons, perhaps because they have been harsh or drastic. 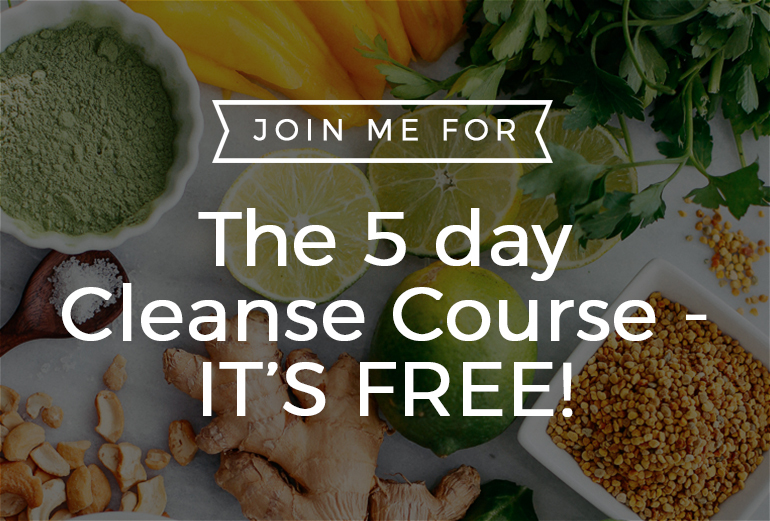 It’s back and improved – the 5 Day Cleanse Course and it’s FREE! I want to share with you some sensible short term changes you can add to your regime that help your body eliminate toxins in a gentle but supportive way. Our bodies can respond in various ways to cleansing and it can be normal to feel a little headachy or nauseous when beginning any cleansing routine. Best consult your health care professional if you are in doubt but know that these symptoms should only last a few days at maximum. The load we place on the liver is quite epic with modern lifestyle and for this reason, helping it along every once in a while can make a massive difference in helping with purification and healthy cell function. My best fix it to flush the liver is dandelion tea (or Pu Gong Yin in Chinese Medicine). It’s readily available and helps to clear the liver, clear head and toxins. Using the tea bag variety found at the health food store or supermarket means you can easily purchase and reap the benefits. I’m not necessarily talking heart from a western perspective here but TCM recgonises that each organ pertains to a particular emotion. Complete cleansing for me, means we need to tick the box on not only the physical but the emotional aspects of health too, so for this reason adding in a little TLC for the heart can be just wants needed. Many patients report whilst cleansing they feel particularly vulnerable and emotional and since our emotions can absolutely drive our health (think about a time when you received bad news and you immediately felt sick in your stomach – it’s a real feeling!) it makes sense to take care of the master emotion controller – the heart! Rose is a TCM herbal ingredient used to support healthy heart function. My personal favourite whilst cleansing is to draw on the benefits of aromatic herbs – using the essential oils in a burner or having a beautiful fragrant bunch of roses in your house whilst cleansing will do the trick. Whilst cleansing isn’t necessarily a part of TCM theory, I’ve recgonised for my patient’s an absolute change in health when we begin our treatment with a short cleanse. The benefits are amazing and the best part of all, you feel lighter, brighter, clearer and you glow. There’s everything to love about cleansing. Want in? I’ve got you! The 5 Day Cleanse Course is at your ready. Once you sign up, you’ll receive confirmation that you’re in. You’ll then receive the support you need in the lead up to your 5 day cleanse, you’ll receive all the info you need including your meal plans as well as access to our cleanse community. All for FREE! Come join in the fun. There’s nothing to lose and I’ll be there to hold your hand each step of the way. Click here to learn more or join in the fun! Did this cleanse over four years ago, right before I conceived my daughter! Ready to dive in again!